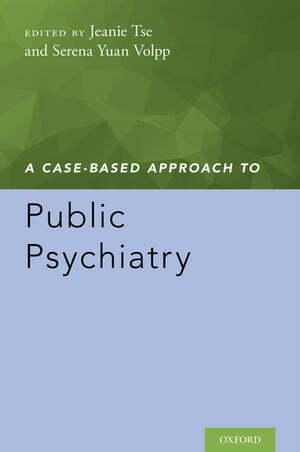 Collins Booksellers - A Case-Based Approach to Public Psychiatry by Jeanie Tse & Serena Yuan Volpp, 9780190611019. Buy this book online. Expert public psychiatrists use case studies to share best-practice strategies in this clinically-oriented introduction to community mental health. Today, the majority of psychiatrists work with people who suffer not only from mental illness, but also from poverty, trauma, social isolation and discrimination. They cannot do this work alone, but instead are part of teams of behavioral health workers navigating larger healthcare and social service systems. In an increasingly complex healthcare environment, mental health clinicians need to master systems-based practice in order to provide optimal care to their patients. The rapid development of public psychiatry training programs is a response to the learning needs of psychiatrists in an evolving system. The book begins with seven foundational principles of public psychiatry: recovery, trauma-informed care, integrated care, cultural humility, harm reduction, systems of care, and financing care, using cases to bring these concepts to life. Then, using a population health framework, cases are used to explore the typical needs of different age groups or vulnerable populations and to illustrate evidence-based/ best practices that have been employed to meet these needs. Common to all of the chapters is a focus on the potential of each person, regardless of illness, to achieve personal goals, supported by a clinician who is also an advocate, activist and leader.